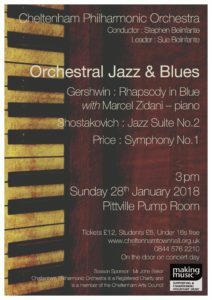 The Cheltenham Philharmonic Orchestra warmly invites you to join us for our 2018 Winter Concert : an afternoon of music inspired by jazz and blues. We are delighted to welcome back the brilliant pianist Marcel Zidani to play Gershwin’s famous Rhapsody in Blue. The concert also features Shostakovich’s dazzling Jazz Suite No.2 and the rarely performed and unjustly neglected Symphony No.1 by Florence Price.